Sartre, like Camus, has always been concerned with salvation. Both denied God and both were Catholic renegades. But Camus, seeking participation in life and reconciliation with nature, asserted man's right to happiness here and now. For Sartre, given the condition of the world, Camus' philosophy was merely sentimental or inspirational, an example of what he calls "bad faith." It is only by traveling in "the direction of History" that man's destiny can be realized. And for Sartre that meant the socialist future. Between Existentialism and Marxism, a collection of his most recent essays and interviews, emphasizes the dialectical turning point when existential or subjective awareness is heightened by neo-Marxian analysis, when the purely symbolic act enters the arena of real action, when universal values transcend individual consciousness. "How a man comes to politics, how he is caught by them, and how he is made other by them" -- this defines Sartre's rocky journey. He tells us that "the Vietnamese are fighting for all men, and the Americans against all men," that "the machine cannot be repaired; the peoples of Eastern Europe must seize hold of it and destroy it," that the "duty of the Left" is to learn "to unite all the exploited to overthrow the old ossified structures" and thus attain the true revolution. In short, another version of the Absolute which Camus, of course, condemned, as tyranny, but which Sartre insists is the only path to freedom. 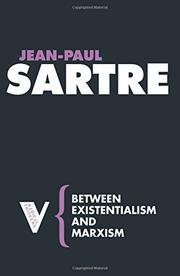 Sartre's brilliance, however, is not to be seen in these cloudy ideological discussions, but rather in the three essays on Kierkegaard, Mallarme, and Tintoretto, striking and original pieces which inflame an otherwise ponderous book. Here he deals with the "quest for purification," the creative man's eternal task, makes concrete ideas which elsewhere are abstract, and in the celebration of Mallarme, in particular, writes with such power that he produces a sort of prose poem.